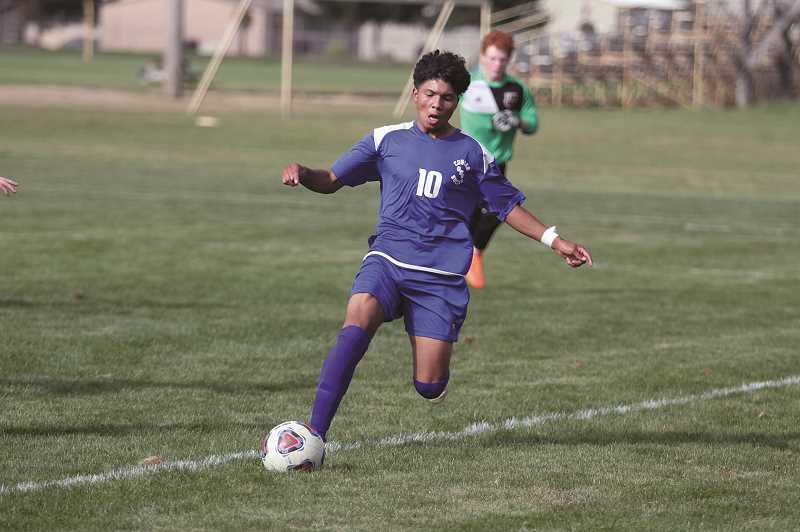 It took the first two games to get in a rhythm, but once Gervais junior Kevin Flores found his flow last week, the only thing that could stop him was the final whistle. The Cougars' forward scored five goals against the Yamhill-Carlton Tigers on Friday, capping a week in which the boys soccer team picked up its first win of the season in a late 4-3 rally over the Dayton Pirates on Wednesday, followed by a 6-0 win over the Tigers. It was a refreshing turnaround in the second week of the season after Gervais opened the season with a 5-0 loss to the Oregon Episcopal Aardvarks in the Cougars' lone non-conference game of the season. "To be honest, we started a little rough," Flores said. "Players weren't in the game, they weren't getting focused. We need to train harder — that's how we got here." Gervais is looking to maintain its hold as the team to beat in the Special District 2 standings after winning the conference outright in 2016 and rallying from a third-place finish last year to win the league title over Taft in the conference championship game. But the Cougars are in a bit of a transition year as the team attempts to weave in a group of five freshman to the varsity roster, and No. 1 Oregon Episcopal (3-0) gave the Gervais newcomers an eyeful of the level of play to expect for the coming season in the blowout loss to start the season on Aug. 28. "We start out with these new incoming freshmen, some who haven't played a game in their life," senior keeper Kevin Borja said. "First game, judging by the result, was rough." Gervais was looking to shake off the loss when it hosted the Dayton on Wednesday, but the Pirates have been steadily on the rise, improving every season since bottoming out with a winless campaign in 2014. Dayton beat and tied Gervais in its two games against the Cougars last year and were eager to keep the streak going in the league opener on Sept. 5, taking an early 1-0 lead. But credit to the Cougars, whenever Dayton scored, Gervais answered. After the Pirates' opening goal, sophomore Jesus Torres dribbled through three defenders and finished with his right foot for an unassisted goal to tie the game at 1-1. Dayton went up again on a strike from the right side of the box, only to be answered by Flores on an assist from freshman Luis Puentes to knot the game at 2-2. The Pirates immediately struck back minutes later to go up 3-2, but Torres tied the game on another unassisted goal, sending the two teams into the final 10 minutes of the game anxious to pull out a last-second victory. Gervais finally took its first lead of the game from an unexpected source, freshman reserve Cesar Giron, who emerged from a scrum around the Dayton net to head the ball in with two minutes left in the contest, delivering the win. "The last three minutes came down and everybody was shooting the ball inside," Giron said. "Someone kicked the ball, it flew up in the air, and I just happened to be at the right place at the right time and tapped it in with my head. Everyone was stopped, because they all thought the ball was going offside." It was the break the Cougars needed to kickstart the season. Gervais held on for the final few minutes and the team celebrated a flawless start to the league schedule. "I'm proud of him," Borja said about Giron. "I told him to keep working like that he'll earn a spot in the starting lineup." In the following game against Yamhill-Carlton, Gervais quickly got into a groove. Flores appeared to be on his way to a sure goal when he was tripped up from behind on a breakaway just outside the box. Torres took the free kick from the top of the box and sent it into the back of the net for the 1-0 lead. The Tigers had a chance to tie the game minutes later on a penalty kick, but Borja guessed the trajectory of the incoming shot — low and left — and punched it out of the way to keep Yamhill-Carlton scoreless. "I felt my players were confident in me, I was confident in myself," Borja said. "There is nothing to go wrong, just staring him down and make him nervous." From there, the game belonged to Flores. The Cougars' lone returning First Team All-Conference player from 2017 received a rebounded shot off a free kick from Torres in the 13th minute and placed it in the back of the net to make it a 2-0 game. Neither team scored for the remainder of the half, but Flores came out a man possessed in the second half, scoring goals in the 44th, 51st, 70th, and 78th minutes to finish the game. "At the beginning, I didn't do so well. I just wasn't in it," Flores said about the opening games of the season. "But this game, I had to get in. I had to focus and get into the game." After the close call against Dayton, Flores made sure there was no doubt of the outcome against Yamhill-Carlton and is looking to bring that intensity to the remainder of the games moving forward. "We've got to always keep in mind that everybody's going to go in to win the game," Flores said. "Everybody wants to win it, but the person who wants it more is going to win it. You've got to want it more and put the effort in. Don't just say it, you've got to show it." Gervais (2-1) continues its season this week when it travels to Blanchet Catholic (1-0-1) on Wednesday, followed by a home contest against Salem Academy (0-1) on Friday.